Formed by The Alliance for Solar Choice (TASC), KULOLO (Keep Utilities Locally Owned and Locally Operated) is promoting publicly owned or municipal operated utility models. But digging deeper, one needs to question how can the TASC growth model and its unholy alliance with the Green Tea Party uphold the seven principles of a cooperative or even accept an electric company as a government run entity with the Tea Party's opposition to bigger government. The motivation and purpose of TASC and KULOLO appear to be incongruent especially given our isolated island and finite grid conditions. 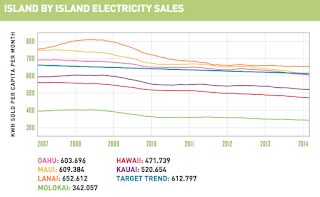 To follow my thought pattern, I need to address fallacies that are continually repeated and one needs to understand some facts about the current Hawaii electricity system landscape. However, the feedback from my non-energy sector friends is that my posts contain too much to digest at one reading. So for the next couple of days I'll try to breakdown information in the hopes of making it more manageable by taking small bites of a complex problem. Fallacy No. 1 - Many have told me that they believe HECO (when I use HECO I also include its subsidiaries Maui Electric Company and Hawaii Electric Light Company) purposely stall or prohibit rooftop PV installations because it cuts into their profits. Reality - HECO's revenue requirements are set and approved by the PUC and are not tied to the amount of electricity it sells. Fact No. 1 - Rooftop PV installations and energy efficiency programs have impacted electricity demand causing a decline in electricity sales (see graph, click here for source, see Driver #2). Explanation - Traditionally, an electric utility revenue requirement would be met through its electricity sales requiring growth in demand to be profitable. 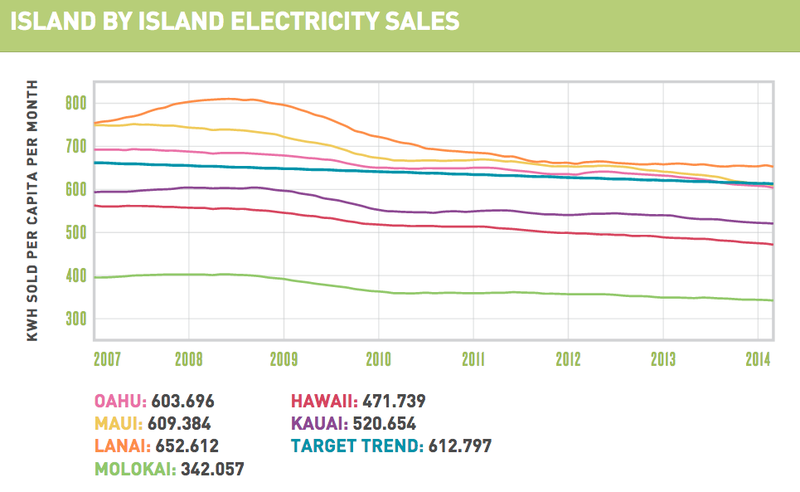 However, since 2011 HECO's revenues have not been tied to electricity sales in a rate design concept called "decoupling" to promote energy efficiency and renewable energy policies. Decoupling separates or "delinks" the cost of operating an electric utility from the amount of electricity it sells. Tariffs are used (Hawaii uses a Revenue Balancing Account tariff) to adjust rates up or down to "true-up" to meet the electric utility's revenue requirement between rate cases. With the exponential and subsidized growth of rooftop pv driven by tax credits and a net metering program that needs to be reformed, if you think you are screwing HECO by installing and oversizing your system to zero out your bill you would be wrong. You are just shifting more of the burden of covering the fixed costs of the electric grid to customers who do not have pv systems. This is why the PUC's Decoupling Investigation (Docket No. 2013-0141) and Distributed Energy Resources (DER) (Docket No. 2014-0192) dockets are so important to make the necessary course corrections for a more equitable electric system. The link to the 2013 PUC press release will give you background on the PUC's reasoning to open up the decoupling investigation and my earlier post, Prisoner's Dilemma, touches on DER challenges. Future post: I'm not sure yet how to explain it yet but next topic will probably be how residential rooftop pv is affecting the grid.